Everest Base Camp Helicopter tour is an awe-inspiring journey for the close-up view of Mount Everest and its neighboring mountains, glacier and panoramic landscape. Everest Helicopter tour is especially for the people who aim to visit Everest base camp in a short time without going long days of trekking. Helicopter tour to Everest Base Camp begins from Kathmandu airport early in the morning. It flies to eastward parallel to the Himalayan range that allows you to see gigantic Himalayan range which is spreading to the northern borderline of Nepal. Reaching Lukla airport it stopover there for a while for fueling. Then it continues flying over Namche Bazaar and lands in airstrip of Shyangboche or helipad of Everest View hotel. After breakfast at Everest View Hotel, one of the highest placed hotels in the world, the helicopter fly towards Everest Base camp. From this flight, you can also enjoy the breathtaking views of other mountains of Everest region like Mount Amadablam, Thamserku, Cho Oyu, Nuptse, Pumori, and others. Following to the flying over Khumbu ice falls and glaciers the helicopter will land at the Everest base camp. In climbing season Everest Base Camp is generally swamped with camping tents and climbers. If it is difficult to land at Everest Base Camp it will land nearby Kalapatthar. This is your exciting lifetime moment. Take photos of world’s tallest mountain and its beautiful scenery. Subsequently, you will fly back to Lukla for some break. Then you fly back to Kathmandu. 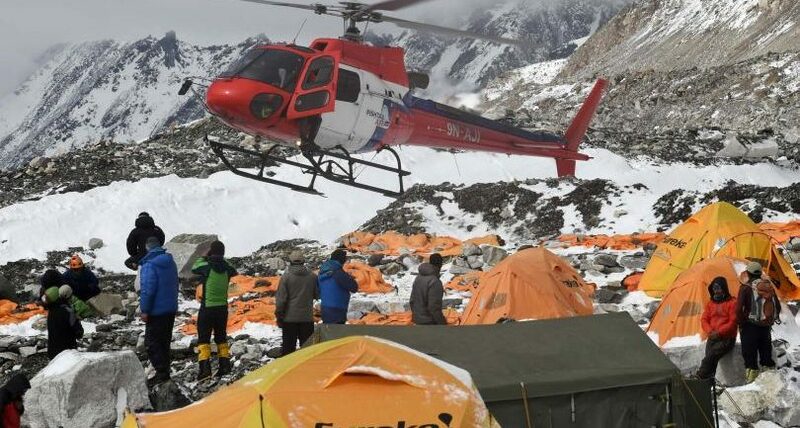 The total duration of this wonderful Everest Helicopter day tour is 4 to 5 hours. Excellent Himalaya Trek & Expedition organize Everest Base Camp helicopter tour in charter basis for individuals, couples, families, and group of friends. We offer competitive and reasonable price for Everest Base Camp Helicopter Tour. It includes helicopter charter flight expenses from Kathmandu to Everest Base Camp and also returns to Kathmandu. The package cost will be different according to your group size (the number of persons you travel together) and the services you choose. For the price, you simply send us an inquiry with your group size. We back to you with accurate rate price including the list of services within 24 hours. The best time of Everest Base Camp Helicopter Tour is from the month of September to November and from the February to May. During this period weather becomes pleasant with outstanding panoramic views of Mount Everest and its surrounding Himalayas. We will be happy to organize this breathtaking tour trip on any date which you feel comfortable. Please select your date and tell us it. Everest Base Camp Helicopter Tour is an outstanding trip in Nepal. You can make it further exciting by joining in extra activities/ side trips. As the interest of people is different from each other, we have put these extra activities as optional tours. They are not included in your package cost. On your request, we offer you. The list of optional activities is displayed in right column. Day 2: Helicopter charter flight to Everest Base Camp/ Kalapatthar. Fly back to Kathmandu. Highlight: Magnificent views of Mount Everest, the world’s tallest mountain and its surrounding mountains, Khumbu Glacier, Everest Base Camp, Kalapatthar. Highlight: Visit of Boudhanth Stupa, Pashupatinath Temple, Bhaktapur/ Culture Show and dinner with Nepali Cuisine. Day 4: Departure from Kathmandu, Nepal.